For some time I've been working on several new projects. Maybe its time you folks see what I've been doing! One of my favorite has been drill boxes. Over the last several years I've purchased a number of vintage boxes and reverse engineered them. Dimensions have been pretty close to the originals. 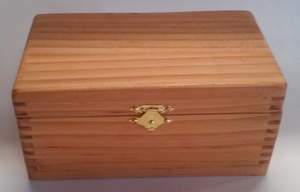 Most of the old boxes seem to be made of white oak, of which I do have a supply, but I decided to go with quarter sawn Douglas fir instead. ......So it was off to a local Tandy Leather store to pick some brains and learn basic leather working!! 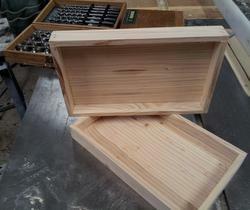 Viewers will note the pictures shown here are of two box styles I'm working on in conjunction. 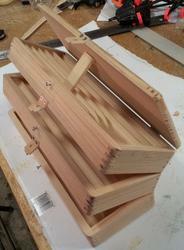 The first style is a rendition of a CE Jennings triple tiered box. Overall, the design is relatively simple, but several technical challenges popped up along the way. The biggest problem was getting slots for each bit plowed into the pine shelves. This issue has been solved however and I will soon be making batches of these. Another issue was the clunky look to the screws in the leather "hardware". 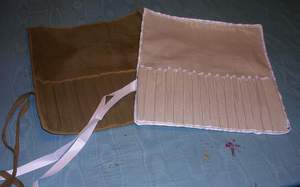 This problem has been solved by using a special leather adhesive. The screws will also be replaced with copper tacks that will be clinched on the inside of the boxes. The second style of box was taken from several examples of Irwin boxes. Even though this is a much simpler box, it required a search for the clips that took almost six months! In the end, I settled on nylon clips that are shorter than the originals. Here again, it will be an effort to keep cost down. The original boxes features a metal plate that the clips would simply be pressed into. My version uses a wooden shelf which not only compensates for the shorter clip, but offers some "meat" for them to be screwed down into. The neat thing about this particular box is that it can be offered in several renditions with several selections of bits. They are finally here! 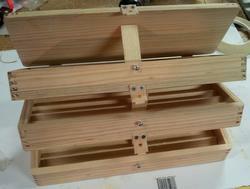 I've been working for some time working out the bugs on these drill boxes. We now have two styles to offer. 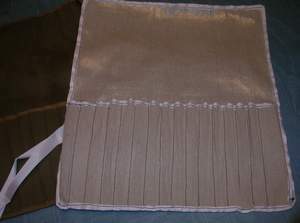 Both have been styled and diminished from existing boxes that were taken apart and used as patterns. 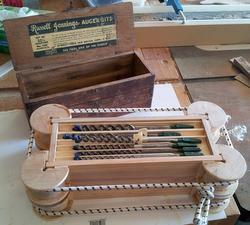 The first was taken from original Jennings three tiered box while the other was patterned from several Irwin boxes. 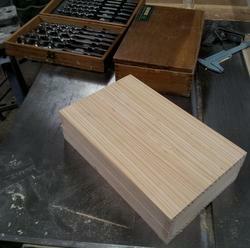 These boxes are made from straight grained Douglas fir with yellow pine inserts. 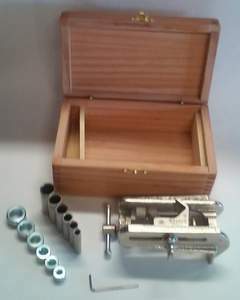 Hinges on the "Jennings" style box are the 5mm hidden barrel type while the "Irwin" style box will employ flat brass hinges. 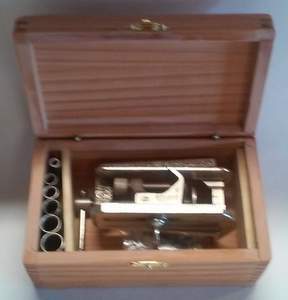 Both of these boxes will use the standard brass clip pictured here. The three tiered "Jennings" box is $40 while the "Irwin" box will go for $30. Please call or write to order your box. 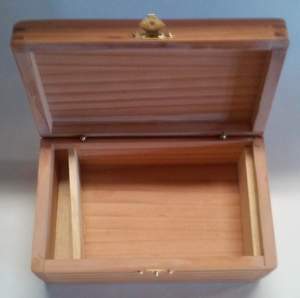 Check out our Drill Boxes tab to see them. I'm not sure when I will be able to offer the sets. I've done everything I can do to put this together. Once the bushing issue is taken care of, I will be posting these for sale. My plan right now is to offer the later version. I'll let the customer choose between cast iron or aluminum.